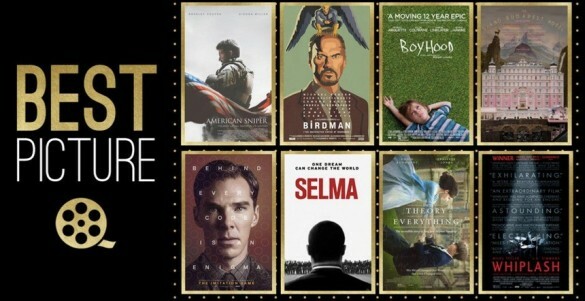 This week on the InSession Film Podcast, Erin Rizok joins us once again as we discuss the 2015 Oscars and hand out our predictions for the big night. Keep in mind, we did record this BEFORE the Academy Awards ceremony. So take a listen and see how our predictions faired with this year’s Oscar winners. Erin was a fantastic guest once again, and if you missed her first appearance on the show, check out last week’s Extra Film podcast where we discuss Fifty Shades of Grey! We open up our Oscar predictions with the music and writing categories, two of my favorite at the Oscars. Most people know that Original Score is my (JD) personal favorite categories, so it was fun opening up the show with the music categories. For Phase 2 of our Oscar predictions, we get into some the meatier categories such as Best Director and Best Cinematography. However, we also dive into a favorite category here at InSession Film, the animated films. PS, after seeing the Oscars, don’t get us started on that upset. RELATED: Listen to Episode 104 of the InSession Film Podcast where we review Kingsman: The Secret Service! For Phase 3 of our Oscar predictions, we discuss the big enchiladas of the night with the acting categories and Best Picture. This discussion was a little lengthier but warranted and a lot of fun. Hope you enjoy!